We’ve had a couple of seemingly unrelated coincidences lately that I’m starting to see a connection between. 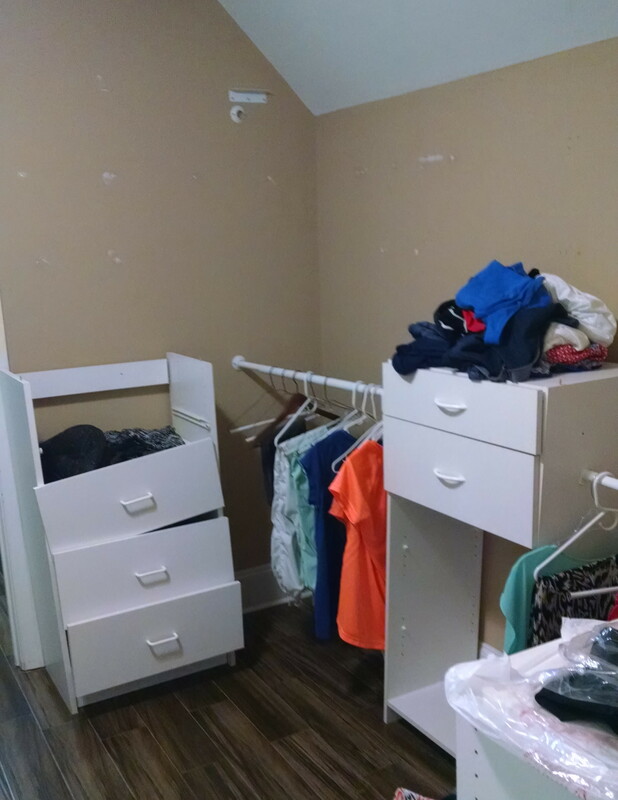 We’ve been asked by several clients recently to replace melamine closet systems that failed within a year or two of their installation, and we’ve also heard from a few potential clients that they’ve had bids from or decided to go with other companies that promise to do similar work as we for substantially less. I can imagine how difficult it must be for someone who has never purchased a custom closet to discern the differences between one system and another. They all seem to look pretty much the same at first glance, and they all claim to be the best. So I thought this would be a good opportunity to point out some of the things to look for when comparing custom closet systems and the companies that make and install them. There wasn’t much left of this system by the time we were called. All the hanging sections had collapsed or been removed for safety reasons, and the rest was mostly unusable. First and foremost is the material used. 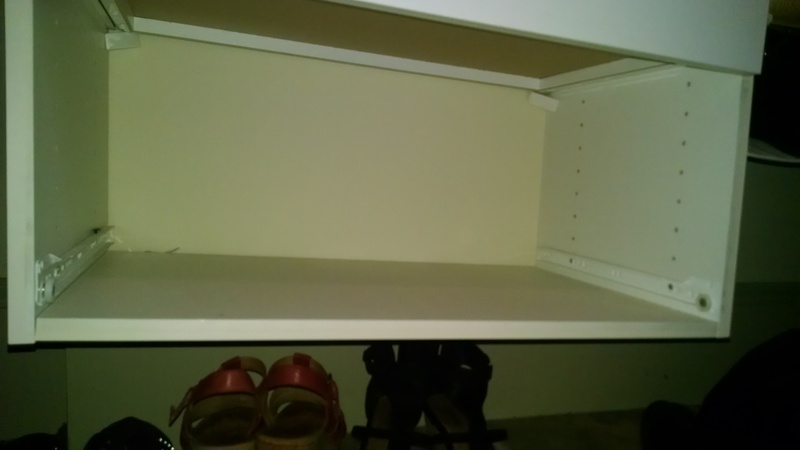 For a melamine or wood closet system, anything less than full ¾” (19mm) thick material is asking for trouble, and the substrate has to be covered on both sides. I’m surprised to see custom installations that use 5/8” thick material, and I know some of the build-it-yourself units from the big box stores use 5/8” or even ½” material, sometimes with one surface left raw. While the boards may seem stiff and strong enough, there simply isn’t enough material at the connection points to be strong enough to last over time. And if there are any raw wood surfaces exposed after the unit is installed, including the undersides of shelves or bottoms, or the top or bottom edges of the vertical partitions, that’s a sure sign that the manufacturer is more concerned with cost than quality. A typical inexpensive metal rail system. The entire weight of the unit is concentrated on the panel just above the notch. The notch itself weakens the panel. Not good. The bracket on the far panel is twisting under the load. The nearer panel cracked where the screws from the bracket compromised the panel’s strength and the bracket is gone. Second is to decide if any or all of the installation will be hanging from the wall or walls, as opposed to resting on the floor, and if so, to determine the method used to mount the units to the wall. 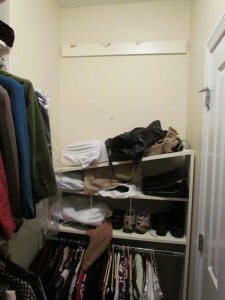 There are two primary types of wall-hung closet installations. The simplest and fastest to install utilizes a metal track or rail which is fastened to the studs, and from which all the weight of the closet system and contents must bear. Each vertical partition hangs from the metal track, either with a simple notch, or often with a plastic and metal bracket which allows some adjustment, and then the shelves and hanging rods attach to or rest on the vertical partitions. 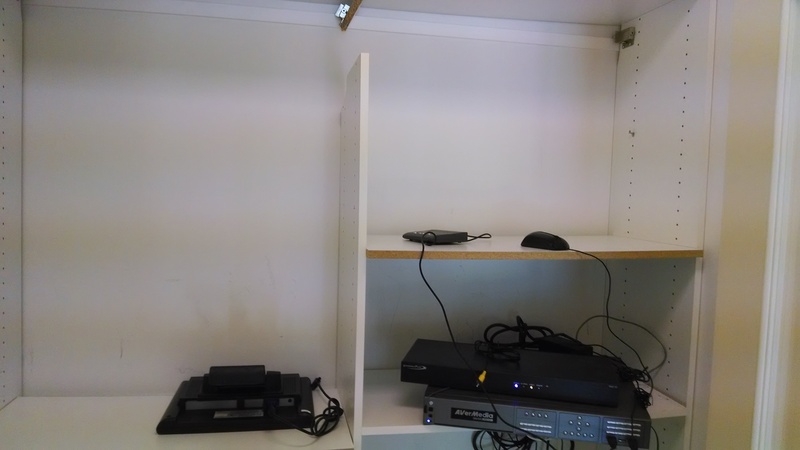 This system has the advantage of being inexpensive and quick to install. The disadvantage is that all the weight of each vertical partition, and all the shelves, rods and clothing attached to it, is transferred to the metal rail at one single point, concentrating all the stress onto the material at one area. In engineering this is known as a lack of redundancy – there is only one point of support, and if that point should fail, there is nothing else to take up the load, and the entire system collapses. 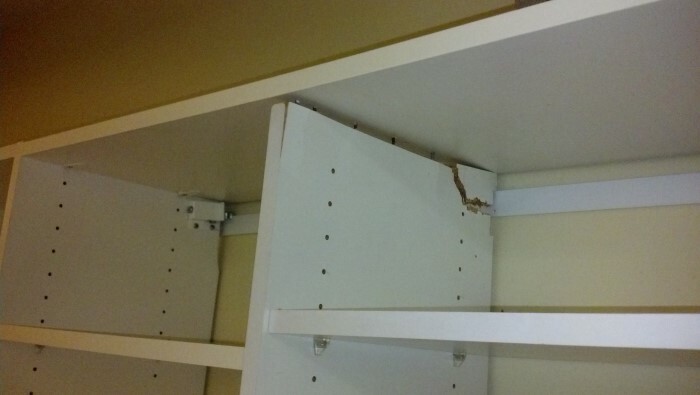 In this case the bracket stayed attached to the metal track, but the partition failed due to the concentrated stress from the weight of all the shelves and contents. 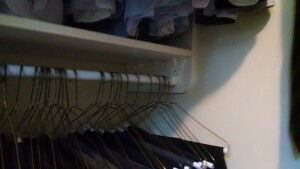 The other method typically used to mount closet systems to the wall relies on multiple wood or melamine cleats, often referred to as nailers, to attach both the shelves and partitions to the wall. With this method of construction, each section has multiple points of support, typically a dozen or more, all of which would have to fail simultaneously in order for any one part to move. 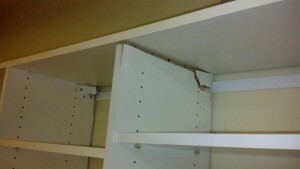 The shelves and nailers are screwed directly to the studs in the wall, and in turn support the vertical partitions. Multiple nailers means multiple screws into the wall for each section, and multiple connection points between sections. 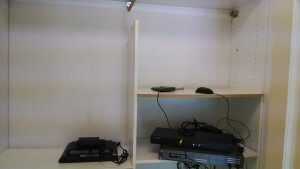 This system relies on plastic brackets to hold up the shelves and the hanging rod, and hold the entire system together. Clearly not very secure or durable. However – just because a system utilizes cleats or nailers doesn’t mean it’s well-designed from an engineering standpoint. 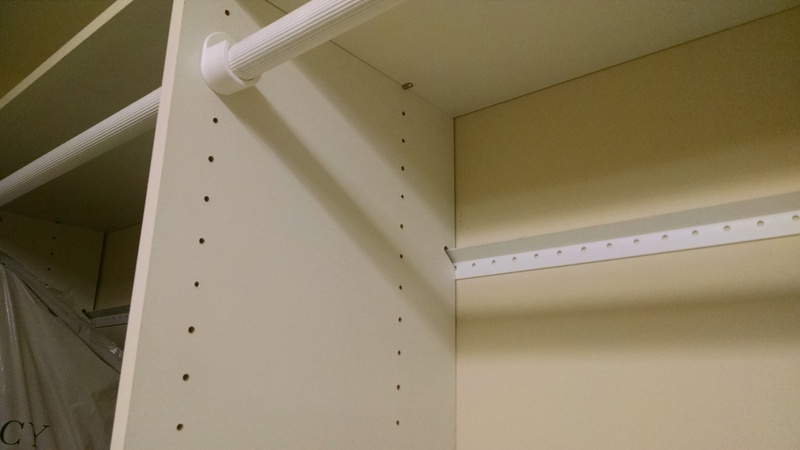 We’ve been called to replace fallen systems that at first glance looked almost exactly like our own construction, but upon further examination were held together by a few nails or screws instead of locking fittings. 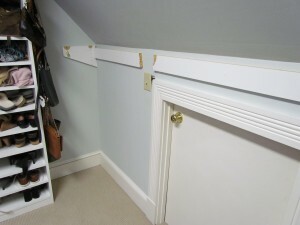 In several instances, the wall or ceiling geometry prevented all the nails or screws from being used, so the installation lacked the required number of connection points, and eventually failed under the load of everyday use. In others, there simply weren’t enough nailers or enough fasteners used. Our system utilizes multiple connection points, always using high-tech cam-lock fasteners, typically 4 or 6 per nailer (I’m not sure why we still call them ‘nailers’ – it’s a term leftover from when our ancestors used to nail cabinets to the wall), and 4 or more per fixed shelf, to spread and transfer the load over the entire system. The cam-lock fittings are inserted into machine-drilled holes, ensuring reliable and repeatable strength at every one of the multiple connection points. This all-melamine system relied on nails or screws to attach the shelves to the nailers from above. 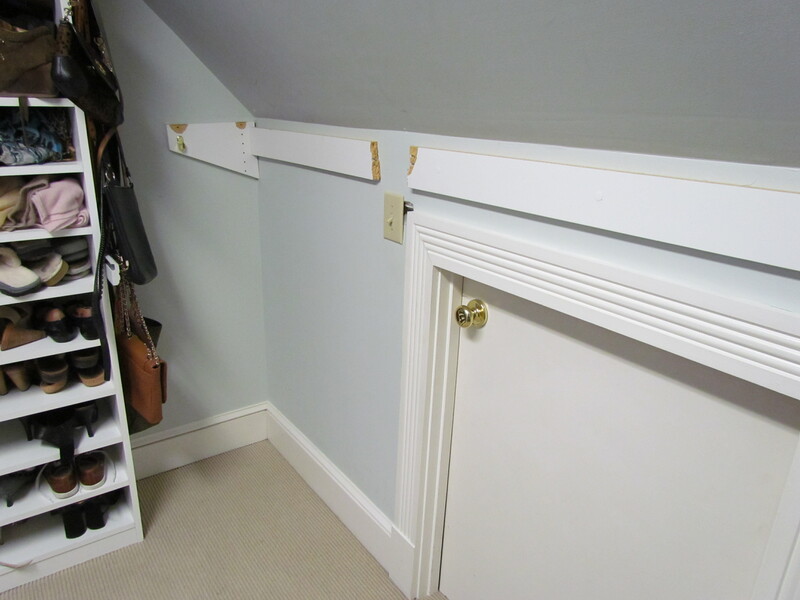 Due to the sloping ceiling, the nails or screws could not be installed. What was surprising is that it lasted as long as it did, but it was destined to fail. One selling point I’ve heard of hang-rail systems or even some nailer/cleat systems, is that even the so-called ‘fixed shelves’ are easy to adjust. The reason those systems are so easy to adjust is that there isn’t very much holding them together. (Watch out for small plastic or metal brackets underneath fixed shelves, where there really should be nailers). While our systems are custom fabricated and solidly constructed, it’s still a modular system which can be modified, adjusted, or reconfigured with relative ease. These small brackets in back just below the drawer box provide virtually no structural support. 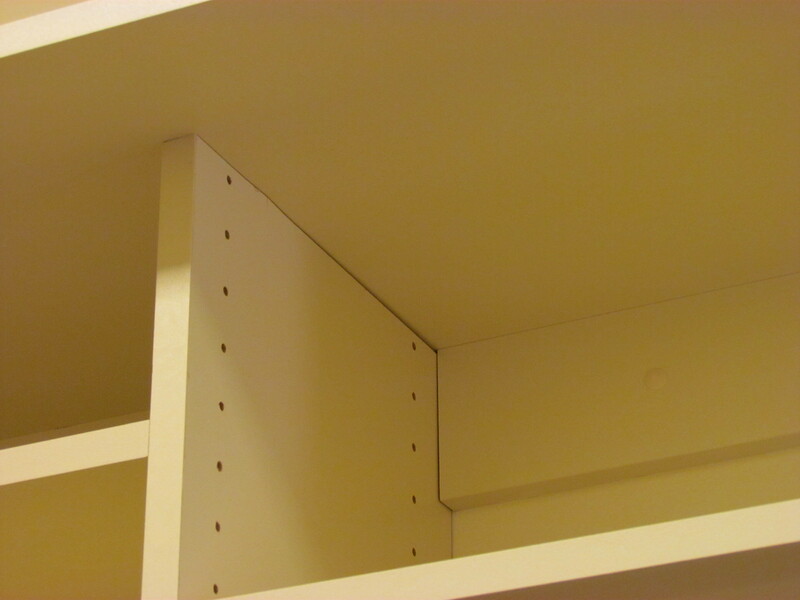 They might prevent the shelves or uprights from moving from side to side, providing an illusion of strength, but once the main support system starts to fail, these brackets are useless. There are other differences which we’ll have to cover separately, but it all starts with the basic construction and installation method, and depends on thorough and solid engineering. We have never utilized metal hanging rail systems, and have no plans to start using them just to be able to offer lower prices. Combined with our standard designs, which include drawer and shelf units resting on the floor, our installations are unmatched for structural strength and durability – without compromising the ability to modify or make adjustments easily. For that reason we stand behind our work for as long as you own your home. Notice the partition is starting to separate from the continuous top and the nailers. Something is wrong here and it’s only likely to get worse. This nailer system looked sturdy – however with only one nailer, and (it turns out) no connections at all between the nailer and the partitions, the weight of the entire system was reliant on the connection between the nailer and the top shelf.